You will receive a set of two LED Pod Lights that are very durable, and very bright. By placing these on top of a disc golf basket shining down, they illuminate the entire cage. 1 Pod light does a nice job, but we wanted to include two of the lights so the cage really looks great! Clearly see these glowing targets like beacons from across the field. Play through the night or set up really cool night target for your backyard. With the push of a button you can change the colors of the lights. You have to be about 3 feet away from the lights with the IR remotes. You can also switch into a color fade mode and control the brightness of the lights. Uses 3 AAA batteries, and last for hours! The lights change batteries by un-screwing the pods. A rubber gasket inside the threads makes it waterproof. The size of each light is 1 inch high x 2.75 inches wide. These lights are very bright and make the disc goal look so cool with the glowing colors reflecting off of the chains. 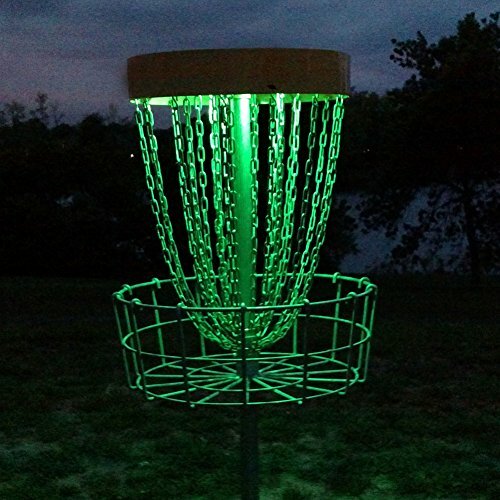 This is a very simple way to create an awesome glowing disc golf basket! If you have any questions about this product by GlowCity, contact us by completing and submitting the form below. If you are looking for a specif part number, please include it with your message.